The roofing industry is experiencing a shortage of roofing professionals. 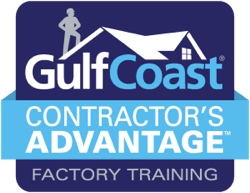 Gulf Coast Supply & Manufacturing developed Contractor’s Advantage™ Factory Training to help fill the gap. Contractor’s Advantage™ helps our contractor customers enhance their business and increase their profits by sharpening their installation skills and techniques. One-day classroom training designed to provide a broad overview of metal roofing systems, governing codes, estimating, warranty, as well as powerful sales and marketing techniques. Ideal for roofing sales professionals, estimators, executives, administrative staff, and business/project managers. One-day hands-on training designed to provide a detailed introduction to proper installation techniques, Gulf Coast® installation details, governing codes & standards, and metal as a component in the roof system. This training will focus on exposed fastener metal roof products and is ideal for installers, foremen, and project managers. One day hands-on training designed to provide a detailed introduction to proper installation techniques of Green American Home stamped metal roofing systems offered by Gulf Coast Supply. This training is ideal for installers, foremen, and project managers. One-day training designed to provide a detailed introduction to standing seam metal roof systems. Prerequisite for this training is Gulf Coast® Hands-On Training. This advanced course will focus on snap lock and mechanically seamed hidden fastener roof systems. Each individual (even if with the same company) must register separately. Contractor’s Advantage™ training is valid for two full calendar years from date of course completion. *Only individuals who successfully complete each course will receive training documentation. Companies are not eligible to receive training documentation, only individuals. Each participant MUST wear Personal Protection Equipment (PPE) at all times while in our warehouse. Participants must wear long pants and closed-toe shoes. Gulf Coast Supply also encourages participants to bring protective eyewear, cut sleeves, and gloves. Recommended checklist for hands-on trainings: snips, drill, and gloves. Refunds up to 7 days before event. “Very informative. This course is well thought out and the Gulf Coast team is helpful and friendly. A must for anyone in the trades.” – Erik L.
“Class was worth every dollar. I learned a lot.” – Chris R.
“Filled with a lot of techniques to make installation easier. Will come back again.” – Joseph F.